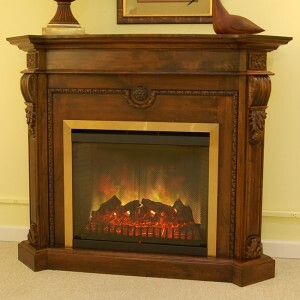 Beautifully styled and constructed completely from the finest quality kiln dried solid wood. The finish is applied by hand and spoke shaved resulting in a distressed patina of a fine antique. Egg and Dart molding frames the firebox with a central medallion and the bold columns have intricately detailed acanthus console brackets supporting the mantel shelf. 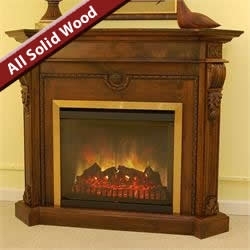 All Fireplace Gateway Heritage Mantels are constructed from all solid wood using the finest quality kiln dried materials. As you browse most stores selling the major brands of fireplaces on the internet and the big high street outlets, you will see descriptions of the electric fireplaces they are offering such as; ‘made from solid woods and wood veneers’ and some will even say ‘made from solid wood’. Be warned what they are actually made from is MDF and Particle board with a wood veneer and cast moldings. In many we have seen in the major retailers even the veneers are not real wood. When we say solid wood we mean it, there is absolutely no particle board or MDF used in any of the Fireplace Gateway Heritage Series mantels. The advantage of an all solid wood piece of furniture is vast, the color and finish has a deep rich patina that will last a life time, Some of our distressed mantels are spoke shaved a process that can not done on a veneered panel and all the carvings are solid also. Free standing wall mantel can be placed against any flat wall. Regular 110v electrical outlet needed. Check the item when it is delivered for damage. Should your item be damaged, be sure to make a note on the driver’s delivery sheet.